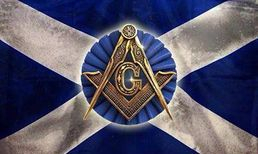 We are a local Masonic lodge originating from the Whifflet area of Coatbridge. Our history dates back many years to 1903 where a number of Brethren resident mainly in the village of Whifflet decided it was necessary to have a Masonic Lodge within the local area for the benefit of the local community. A meeting between a number of brethren from local lodges was held in Oct 1903 in the Douglas hotel and was chaired by Bro. James Robertson, a Master Mason of Lodge Old Monkland St. James 177. It was agreed that the village of Whifflet could support a lodge of its own and a committee was duly formed with the hope of achieving that aim. The Brethren chosen were to become important members of the committee and their names appear all through our history, demonstrating the strong family principles of the Lodge. These are Brothers James Robertson, James Young, John Young, William McAllister, William Spittal, Malcolm Aitchison, James Beattie, William Wallace, John Brown, John Murdoch, William Thomson, John Weir, James Wilson, Archibald Wilson, William Dodds, John Forrest and Duncan Wyper the Lodge Secretary. After only two weeks, at another meeting of the interested Brethren, it was announced by the committee that the promise of support and sponsorship had been received from Lodge Old Monkland St. James 177 and Lodge Coatbridge St. Andrews 544. It was also at this meeting that the committee agreed the name of Lodge would be Whifflet St. John. At a further meeting on 17 December 1903 it was intimated by the committee that the petition had been duly sponsored by Lodges 177 and 544, signed and approved by the Provincial Grand Master and thereafter forwarded to Grand Lodge. 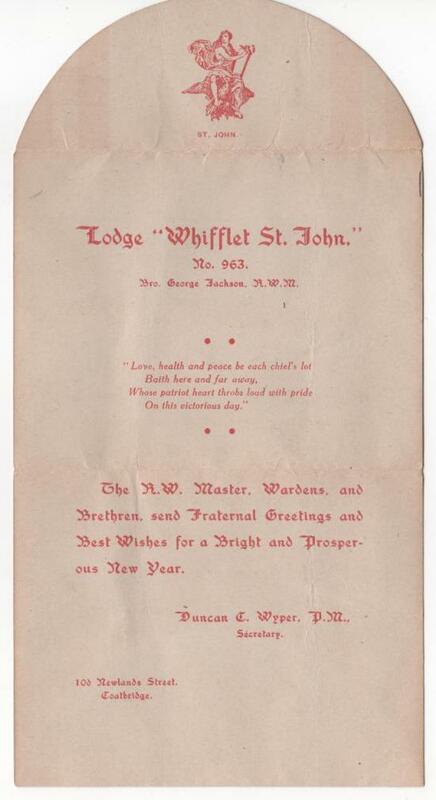 On the 4 Feb 1904, a charter was granted to Lodge "Whifflet St. John" and was registered under the number 963 on the Roll of The Grand Lodge of Scotland. On Saturday 16 February 1904, the Depute Provincial Grand Master, Bro. William T Hay convened a meeting of Provincial Grand Lodge of the Middle Ward of Lanarkshire in Garturk Parish Church Hall and at that meeting, the erection and consecration of Lodge "Whifflet St. John 963" took place when the following office bearers were duly installed. It was decided to hold Lodge meetings in the church hall attached to the then Garturk Parish Church. This particular choice had some influence in establishing the strong church relationship between members of the Lodge and members of church. It is also interesting to note that Garturk Parish Church has many Masonic symbols built into the architecture of the church. The most significant being the cast iron escutcheon round they key hole in the massive front doors of the church. This escutcheon takes the form of the Square the Level the Plumb Rule and the Rose of Sharon. 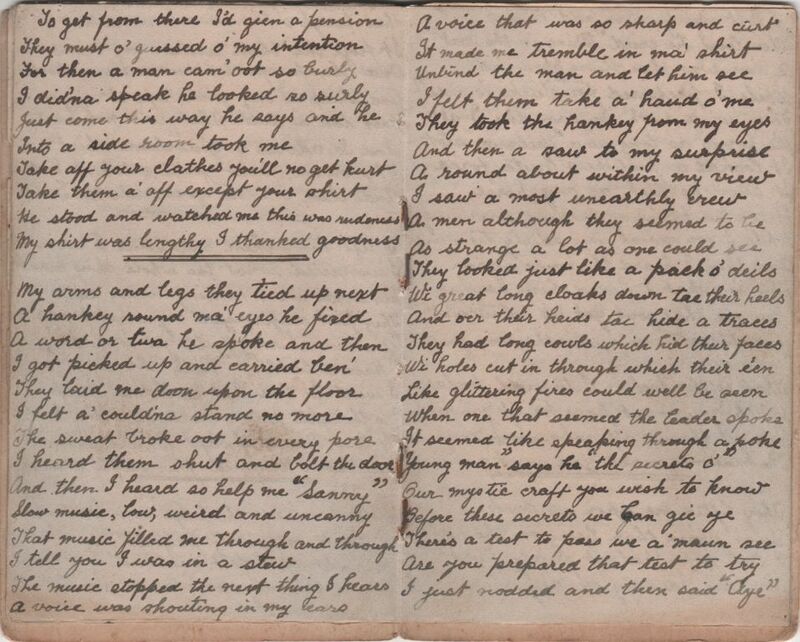 Our founder Master Brother James Robertson was also a man of remarkable talent. He had never held office in a Masonic Lodge, yet the minutes show that no occasion was ever too great for him and whatever situation arose he was capable of handling it in a most dignified way. 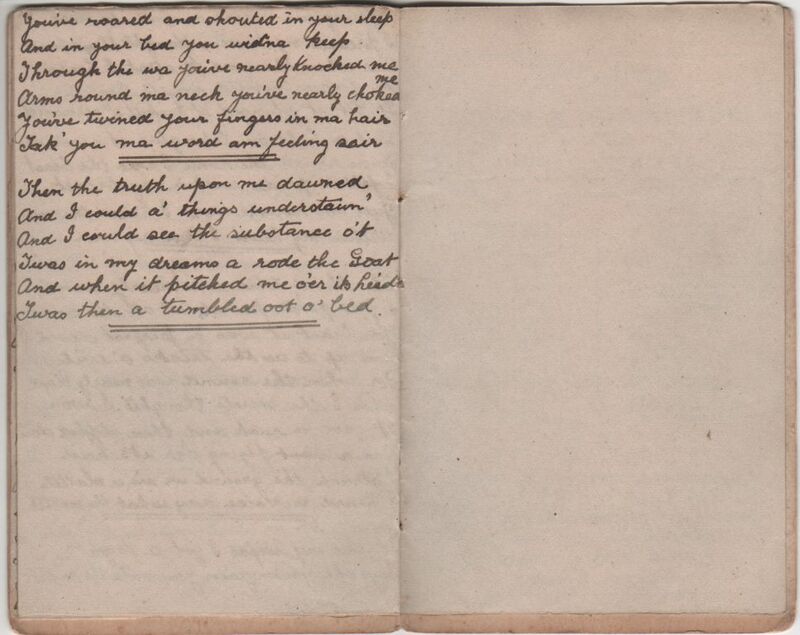 The minute book also shows that in his first 40 years of the existence he installed every succeeding Master. He truly has a remarkable record and one any Past Master would be proud of. 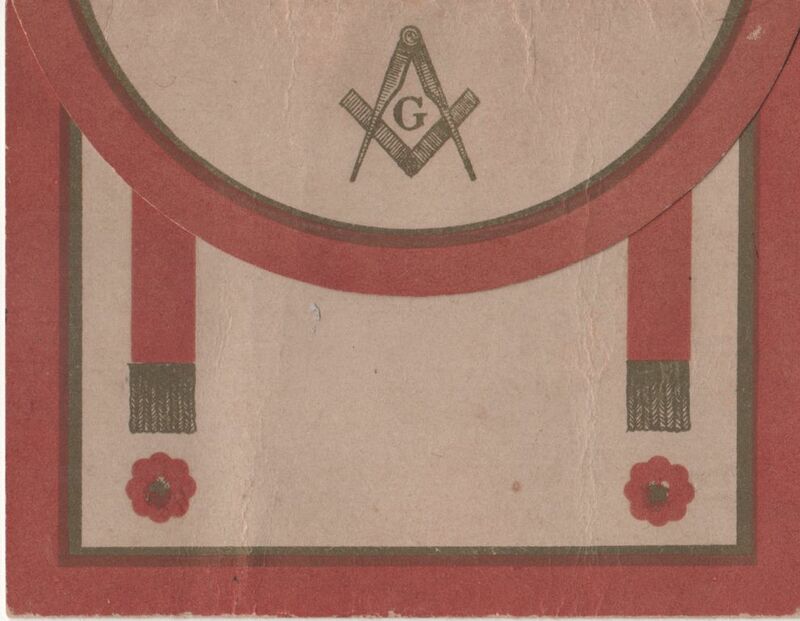 The membership continued to grow steadily but 10 years after the foundation of the Lodge the Country was at war and many of the brethren had enlisted into the Armed Forces. A total of 87 Brethren from the Lodge had enlisted to serve the Colours, there were two Distinguished Conduct medals, two Military Medals and unfortunately six Brethren lost their lives. 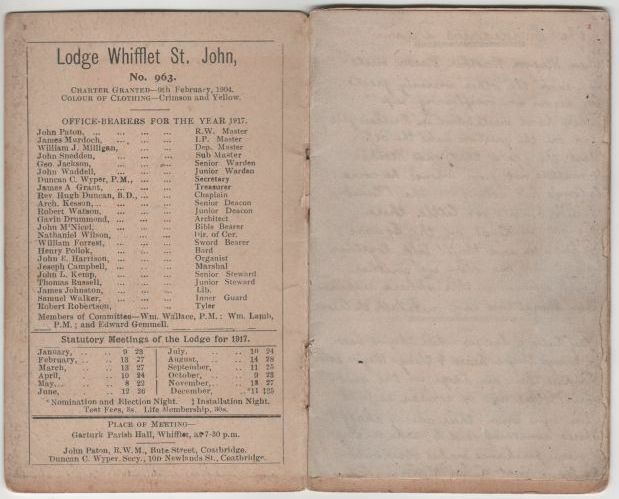 After the war the success of the Lodge immediately continued where in 1919 we had 24 regular meetings and 14 special meetings at which 227 candidates were initiated, passed and raised. The average attendance that year was indicated at around 97 including candidates; however a true reflection of members would be around the 52 mark. The following year showed a drop in the average attendance to 79 with a considerable drop in candidates to down to 86 as compared with 227 the previous year. The next year again (1921) saw a drop in numbers with only 30 meetings and 51 candidates, which was actually more than was expected for that year; a year in which was remarkable in terms of the industrial history of Whifflet. Iron works, engineering works and the mines which were running at full capacity night and day suddenly came to halt. Unemployment was rife, miners were on strike for weeks, and schools were closed after an epidemic of Spanish Flu. Soup kitchens were opened to feed the children of the miners and other unemployed, children were often seen queuing outside the Salvation Army and other church halls with a bowl in their hand waiting for a daily ration of soup. 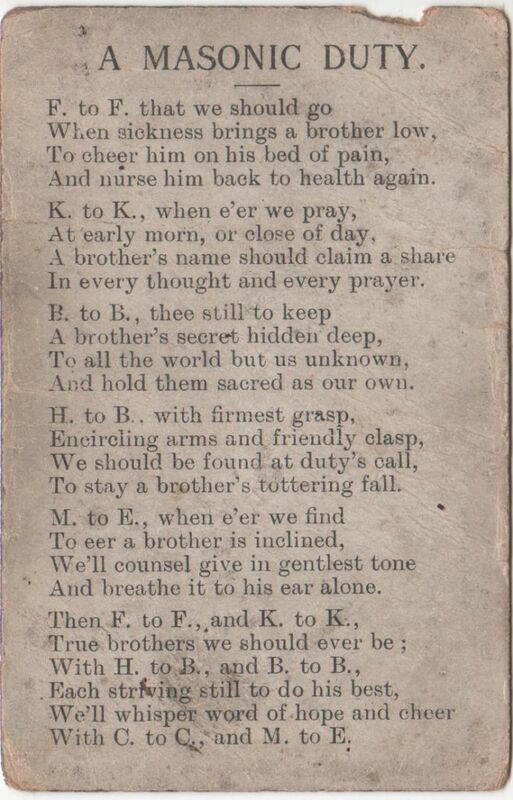 There were regular letters of condolence sent to a brother after the death of a child. Poverty was the companion of all then, yet our Mother Lodge could still attract 51 candidates whilst at the same time giving out benevolent grants to the needy. This unemployment showed its effect throughout the following years and the average attendances and candidates dropped continually year after year and in 1924 shows only 27 meetings and 17 candidates. In view of the circumstances which prevailed in the Country at that time it seems somewhat strange that at the end of 1924 it was proposed that the Lodge take steps to acquire land for the purpose of building a temple. Nevertheless it was agreed to proceed with this plan and a committee was formed, an architect appointed and the land was obtained. A true demonstration of Faith and Hope. It was clearly understood by all the Brethren that funds were simply not available to commence such an ambitious project. Various ways and means of raising the necessary funds were suggested but met with little success and by the end of that the year the fund was in a poor condition. It was indeed very fortunate that a Lodge member could offer the Lodge a loan to the sum of £1000 over a four year period so that the building work could continue and in February 1926 the Temple was finally completed. On 10 April 1926 almost 22 years after our Lodge was first erected, the new Temple was duly consecrated by a Deputation from the Provincial Grand Lodge; the Substitute Provincial Grand Master Brother Colonel P Spence presided over the proceedings. At the end of the same month the first Master Mason degree to be conferred in the new Temple was carried out by Brother James Robertson our Founder Master. The move however from Garturk Parish Church hall where the Lodge had been founded to new premises of her own did not have the effect of increasing interest among the Brethren and again attendances dropped dramatically. Appeals for support from the Brethren had little or no response and in the year prior to our Jubilee extreme pressures were being put on the Lodge to pay the outstanding construction costs. A special committee was formed under the chairmanship of the Founder Master Brother James Robertson. This committee decided that a special fund be set up and thus entered 1929 having a fund with the rather ignominious title of the "semi-jubilee debt extinction fund!” Many schemes for raising money were devised and one of the most successful being a bazaar which was held in Coatbridge Town Hall in October 1930 and this showed a profit of £970. This sum combined with the money raised at other events was used to pay off the contractors and although still heavily in debt this was at least contained within one source from within the Lodge. The year of 1930 proved to be a successful year both financially by reducing the Lodge debts and on the Masonic side by increasing attendances and attracting new members. The new young members were keen to work for the financial success of the Lodge and was quite common at the meetings for one or more of these Brethren to be congratulated on their efforts. These Brethren were quite willing to run dances, raffles and other social functions for the Lodge but strange as it may seem, this was often frowned upon by the older members of the Lodge. Some of the candidates of those years were present at the 50th celebrations of the Lodge and from them we get a true picture of what the Lodge was really like in those days. A quote from one brother read: It was a poor Lodge indeed, not just financially but also in other ways, old fogies (as someone called them) were in office that could hardly say the Lords prayer let alone confer degrees. Most degree work was carried out by Past Masters who were recalled for that purpose, numbers were dire with usually 9 Office Bearers and possibly 2 Brethren, change was needed and required soon. In December 1935 Brother James Murray was duly elected as Right Worshipful Master and from the floor of the Lodge every other office was contested successfully. The "old fogies" were out of office and the offices filled by young men. Under the leader of the Right Worshipful Master these young Office Bearers and the Brethren embarked on a programme of fund raising activity, and supported a personal appeal to the Brethren of the Lodge. In consequence of this, the bond over the Temple was finally cleared in May 1937. One cannot but admire the calibre of Brethren of that time who worked under such extreme difficulties whilst, the Brother of the Lodge who had given the original loan of £1000, must have been very patient indeed, a patient and dedicated member to wait for almost 12 years to have his loan finally repaid. The year 1937 proved to be truly a watershed and turning point in the history of the Lodge. The Lodge was cleared of its crushing debt. The office bearers agreed to turnout at meetings in full evening dress. The standard of ritual and ceremonial work improved beyond all recognition. 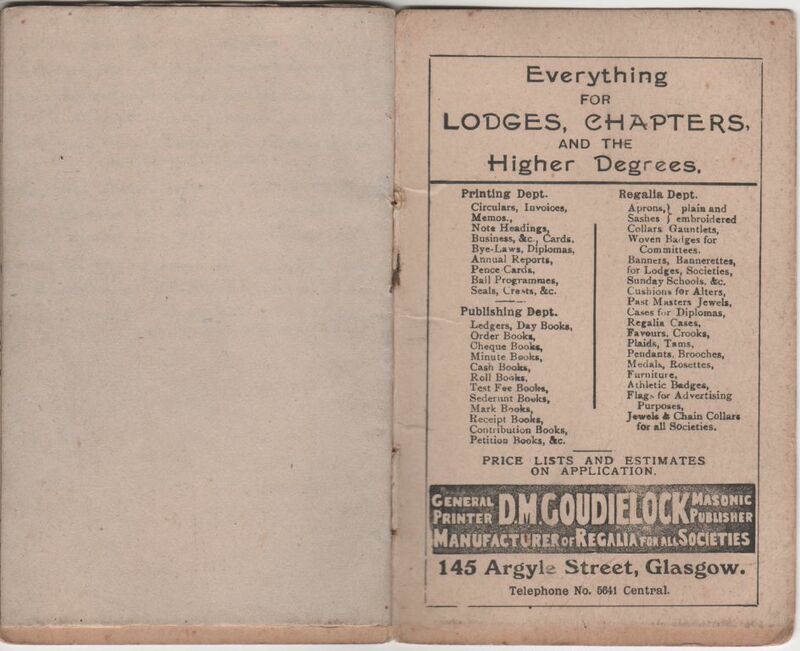 During that year the Lodge attracted 45 candidates, with an average attendance of 62. At the Installation that year the collection for the Grand Lodge annuity fund was £20; a decided change indeed. The upward trend continued for the next few years until 1939 when once again the Country was at war. The following year naturally showed a drop in attendance due to those Brethren who were called up for war duties. A comfort fund was started to provide parcels for the Brethren on active service and the minute book show many letters of acknowledgement received from the serving Brethren. 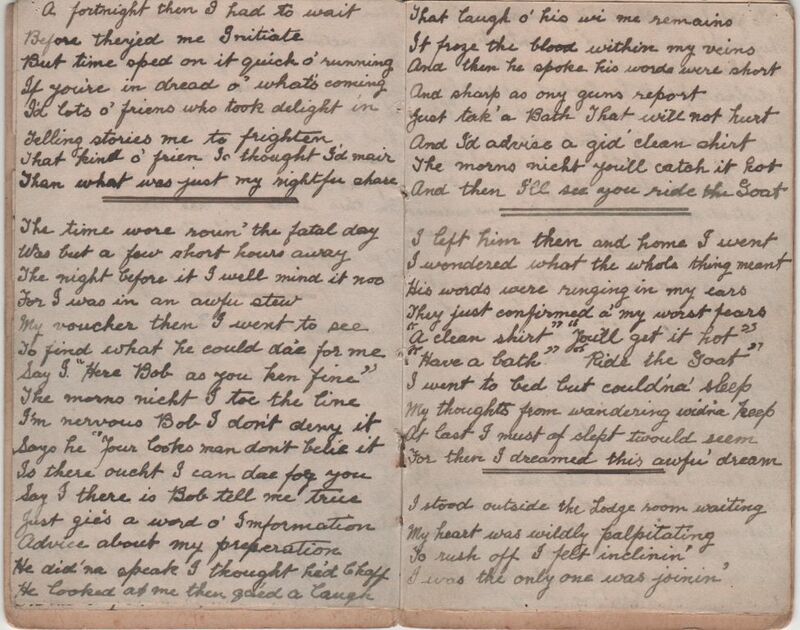 The war years impacted on the Lodge in many different ways. The practice of wearing evening dress at all meetings was discontinued. The Temple was used as a mortuary for accommodating those injured or killed in the air raids. To meet these needs coffins were stored in the basement of the lodge. One amusing item of business minuted during the war years warrants a mention. The widow of a former Lodge member made an application for a loan from the Lodge offering her property as security. This application was considered but rejected, and it can be readily understood why, as the property was in the Channel Islands which at the time was under German occupation. Following the war the same pattern emerged as had been seen following the First World War with a high influx of new members and an increase in attendance at Lodge meetings. The Secretary's report for the first post war year indicated that with 22 regular meetings and 12 special meetings there were 80 candidates. In the Jubilee year of 1954 the occasion was marked with a Jubilee Dinner at which there were present 5 Founder Members of the Lodge, namely Brother James Robertson PM and founder Master, Brother Hugh Mair PM, Brother William Lamb PM, Brothers William Donaldson, Archibald Wilson, Edward Gemmel and Brother John Bell one of our first candidates in 1904. Brother James Robertson PM and Brother William Lamb PM were still attending the Lodge after 50 years; Brother Lamb held the office of Sword Bearer from 1949 until his death in 1957 at the age of 84. The celebration of the Jubilee was a great success and from that day the Lodge seldom looked back. The following years were not completely trouble free but any problems that arose were tackled, overcome and dealt with by the Brethren. The Lodge went from strength to strength and became highly regarded throughout the Province and beyond. The esteem in which the Lodge is held was shown in October 1977 when the Most Worshipful Grand Master Mason of Scotland, Brother Captain Robert Woolridge Gordon of Esslemont during a three day visit to the Province visited Lodge Whifflet St. John. This I think is the only time on record that Lodge had been graced with a visit from the Grand Master Mason. On the occasion the Lodge acted as host at a dinner given to members of the Lodge, their wives and invited guests from Sister Lodges as well as the official guests from Provincial Grand Lodge and Grand Lodge. At a meeting of Grand Lodge Brother Gough simply asked the Grand Master Mason if he would come to his own installation to be held in Lodge Amicicia, London. The Grand Master Mason agreed and accepted the invitation. Arrangements were made and a deputation of 23 Brethren from Whifflet St. John headed by the then Right Worshipful Master Brother Joe Faye splendid in his new silver Right Worshipful Master chain, travelled down to London. At the Lodge we were joined by the most Worshipful Grand Master Mason, Brother Captain Robert Woolridge Gordon, who himself was accompanied by the Grand Secretary Brother E Stewart Falconer and the Depute Grand Master Mason Brother Gordon Laing. We were led into the installation by the Grand Master Mason a truly memorable occasion. The growth and expansion of the Lodge is demonstrated in the number of new associations which were being established between ourselves and Lodges in different Provinces such as Glasgow, Stirlingshire, Ayrshire and the Metropolitan District of Edinburgh. The immediate effect of such visiting was the increase of visits to Whifflet St. John. On one particular occasion a deputation from Lodge Dramatic from the Province of Glasgow came to Whifflet St. John to confer the Fellow Craft degree. The attendance that night was 300 and it was necessary to close tyle the new extension to take care of the overflow. Over the next few years work continued on the improvement of our premises and it was agreed that an extension should be built. Throughout 1975 and 1976 various Brethren carried out the necessary work using the own skills and trades. The work was completed in 1976 and the increase in revenue allowed the annual dinner to retired members and their wives to rise to nearly 200 guests. The Lodge was also committed to assisting Provincial Grand Lodge and provided to that body three Office Bearers, a Substitute Provincial Grand Master, the Provincial Grand Treasurer and a member of Provincial Grand committee. The Lodge was also instrumental in the forming of the Monklands Masonic Community Association Trust which was formed by the Brethren of local Lodges to carry out work of a charitable nature in support of the local community in general. By now arrangements were well in hand for celebrating the 75th anniversary of the Lodge. To mark this occasion a handsome silver chain of office for the Right Worshipful Master was produced. During the design stage for the chain it was thought that it would be good thing to have incorporated into its design the Past Master Jewel of our Founder Master, Brother James Robertson. A search was made but unfortunately the jewel could not be found, subsequently some time later it was recovered and is now worn on the right breast of the RWM as part of his regalia. In some sense we may still have our Founder Master with us at every meeting. For the next few years the Lodge continued to flourish, attendances were on average reaching 130 or so, with an ever ending supply of candidates. The ceremonial and ritual work conducted by the Lodge was of such a high standard that it had become renowned throughout the Province. The social club had expanded and the Brethren were enjoying the fruits of their past labours with the new extension offering greatly improved facilities to the members. The Lodge had developed from the early small beginnings in Garturk Parish Church into a large and powerful organisation, still based on the principles and tenets of the craft, but incorporating into a fully constitutionalised Social Club and a property owning organisation which brought with the subsequent burdens of financial responsibilities. For the first few years of the last quarter of the century unto 1982/83 progress in all aspects of the Lodge working was maintained. Early indications of approaching danger were there to see. These were highlighted by the fall in attendance numbers at meetings and a significant drop in candidates coming forward. This trend was not confined to Whifflet St. John, but was to be seen throughout the land. 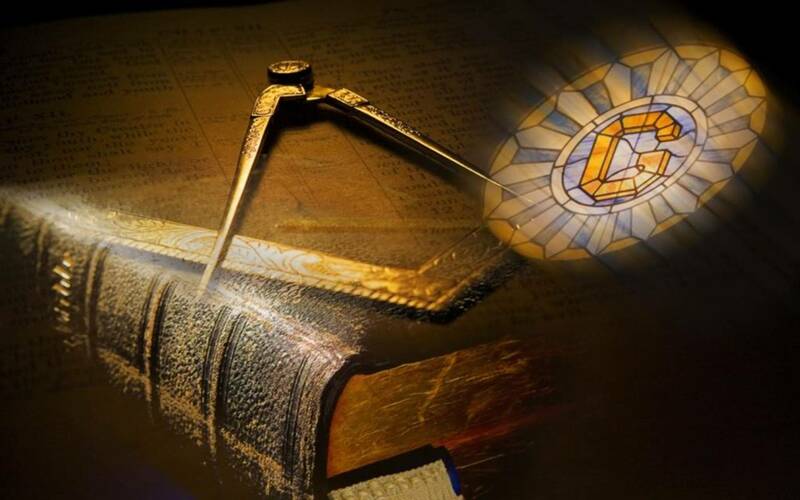 The early drop in numbers soon became a flood and by the year 2000 many thousands of Freemasons had drifted from their moorings in the moral and spiritual foundations in masonry. In parallel with the fall in Lodge attendance there was an even greater fall in the support for the activities of the Social Club. The result of this was a dramatic loss of income. As the income derived from the various activities diminished the cost of maintaining the structure and organisation rapidly increased. By now things seemed more serious, the social club attracted a high tax level, the structure was in need of extensive repair and the general maintenance costs rapidly rose with high inflation. The Brethren conscious of the seriousness of the situation tried to rekindle an interest in the social club and its activities by organising a variety social and fund raising events, but their hard work and effort met with little success. The Brethren faced up to the reality that the Temple would have to be sold. In October 2001 the Temple passed to the hands of a property developer and we now stood free from the shadow that was hanging over us, however we were homeless. In true Masonic spirit and Brotherly love, our two sponsors Lodges St. Andrew 544 and Old Monkland St. James 177 immediately offered to give us a home. After much discussion the Brethren elected to take the offer of St. Andrew 544 and moved with the Lodge furnishings to the Masonic Temple in Wood Street, Coatbridge. The first meeting in the Temple was held on 14 November 2000. We are now into our second century and after the tremors of the past few years we must look forward to the future, our future, the past will always be there for us and never will it be forgotten. The Lodges survival is due to the determination, courage, tenacity and the collective wisdom of the Brethren. It is these same qualities which will ensure its passage through the next hundred years. We have overcome and solved many of our problems and have in some way re-invented ourselves, let us look forward with two fundamental Masonic principles of Faith and Hope. Faith in God and Hope for a glorious future. Over the past few years our numbers have not been as productive as we would have liked however with a few candidates and affiliates we have the capacity to grow. We have core group of members who still carry out their Masonic duties admirably and with the support of our RWM and Past Masters it is sure to be an exciting time ahead. We continue to visit not only the local Lodges in the District but have seen Brethren visiting the Glasgow, Ayrshire and Edinburgh Provinces, this can only further cement the true friendship with the Brethren of the Lodges we visit. It would be remiss of me not to mention our latest accolade in those receiving Honorary Grand Rank. Our Worthy Treasurer Brother Bruce Wilkie PM, received Honorary Grand Inner Guard from the Grand Master Mason in Dec 2008. This is a first for Whifflet St. John and no doubt an honour for Brother Bruce, a superb achievement for which the RWM and Brethren wholeheartedly congratulate you. It is also with great pleasure to announce our Worthy Secretary Bro John Clydesdale PM, received Honorary Assistant Grand Secretary from the Grand Master Mason in January 2019, another great accolade for John and the Lodge alike. Another outstanding achievement for which the RWM and Brethren wholeheartedly congratulate you. Over the past year or so the Lodge has pursued a new focus by going back to basics, utilising instruction classes and aligning meetings to include lodge office bearers conducting degrees. This has proved extremely fruitful and we look forward to another new chapter in the history of the Lodge. This New Year greeting card dates from 1918-19 and is in pristine condition. Thanks to PM Bill Cullen for allowing publication. 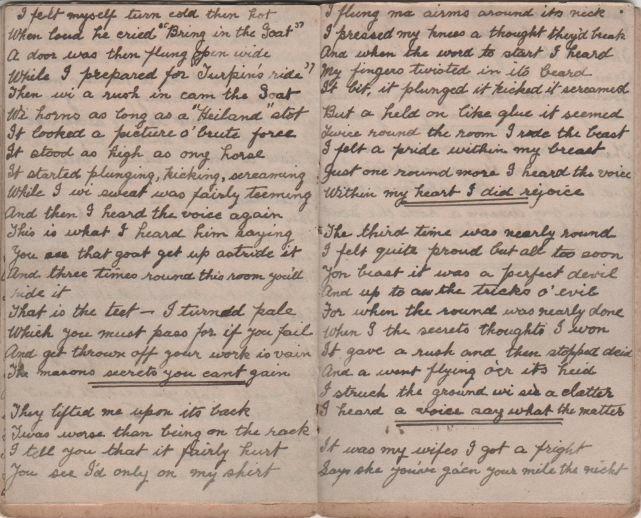 The following pages are taken from the RWM poem booklet dated 1917, a truly excellent find and all in original hand. Thanks to PM Bill Cullen for allowing publication. 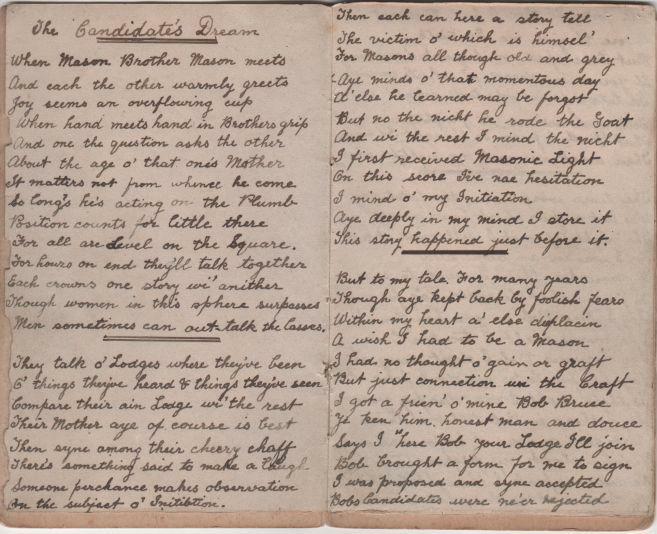 This poem card dates from many decades ago and shows the work continues in similar fashion. Thanks to PM Bill Cullen for allowing publication.